For many cannabis enthusiasts, nothing can beat the aroma of some fine Cheese bud. Zambeza’s White Cheese is a true Dutch classic and one of their most popular indicas, so it made just sense to make an autoflowering variant of this fabulous strain. Be assured, this one absolutely delivers because she combines the easiness of an auto with superb yields and the same great taste of the original! We at Zambeza didn’t need to spend a long time when we set out to create our White Cheese Autoflowering. We already had everything we needed: we took the fantastic White Cheese and added some ruderalis magic, and out comes a superb autoflower without compromises that sure doesn’t need to hide from her feminized sister. For an autoflower, White Cheese Autoflowering brings some pretty good yields to the table with up to 450g/m² of some fine Cheese bud when you grow her indoors. Outdoors, she can yield as much as 220g per plant if everything is optimal. The plant will reach a medium height with 60-90cm indoors and a maximum of 120cm if you grow her outside. Her life-cycle is a reasonably short 70 days from seed to harvest. Know that this good yielding autoflower is very uncomplicated, so even new growers will see results fast without having to worry. What made the original White Cheese so popular is her amazing aroma that beautifully blends the trademark Cheese flavour with some spiciness and refreshing tones. Be assured, this is a smoke that can satisfy even the pickiest cannabis connoisseurs. She’s so tasty you’ll likely not want to put her down once you get your first hit! White Cheese Autoflowering has a moderate THC level of 16%, which makes her effect just right and awesomely balanced; a superbly relaxing stone that won’t knock you out like some other strains. You can still stay focused and simply enjoy her fabulous taste and her endless waves of relaxation when you smoke her. White Cheese Autoflowering by Zambeza has everything you’d want from a superb autoflower. This indica rewards with reliable growth, superb yields, a pleasant high and then her spectacular Cheese aroma. If you’re looking for a worthy autoflowering indica to grow, look no further because you may have just found it! 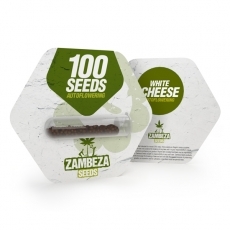 White Cheese Autoflowering bulk seeds are available in packs of 100 seeds for all those growers who want to stock up on more seeds of this first-quality autoflower.